We are big Marvel fans and Ant-Man and the Wasp is no exception. It's such a fun series and I can't wait to see it again, now that it available to watch at home. Since we like to have a little fun with our movies, we put together some great Ant-Man and the Wasp ideas for a themed movie night or party or just because it's more fun! Needing a snack while you watch the movie? I love this Ant-Man & The Wasp Snack Mix from Redhead Baby Mama, especially since everyone can have their own bowl. I am so in love with the idea of games that match the movie you're watching. 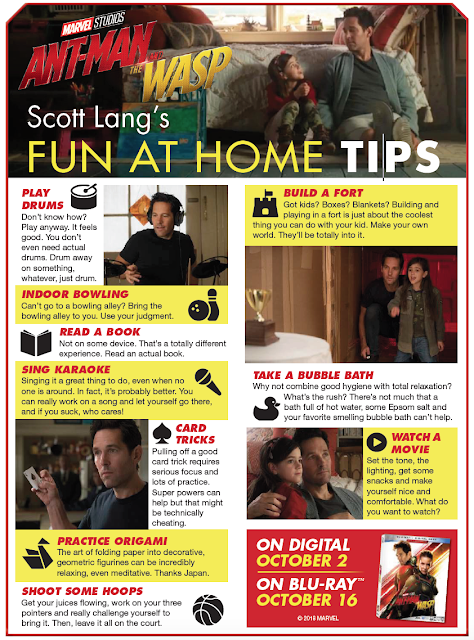 The Ant-Man printable board game from Mrs. Kathy King is simply amazing. These Honey Glazed Ant-Man & The Wasp Donuts from Whiskey + Sunshine would be a perfect treat for breakfast or lunch or really anytime. 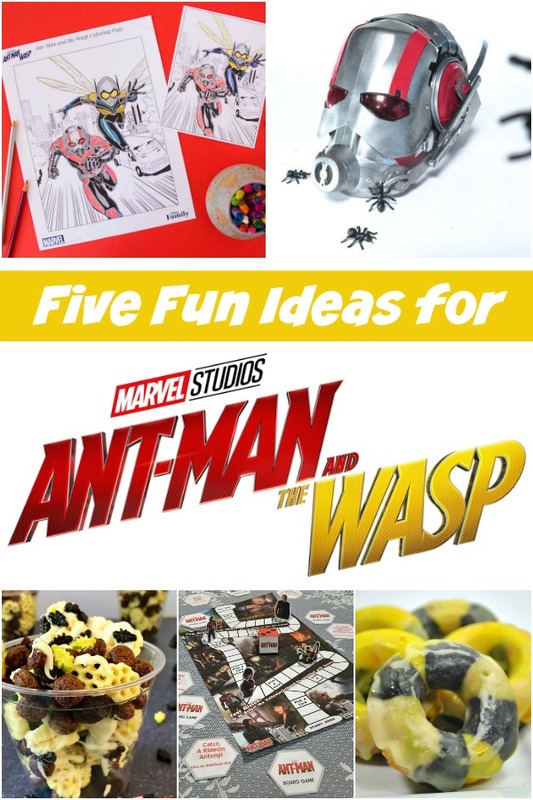 These homemade kids' Ant-Man and the Wasp costumes from Bombshell Bling are the cutest ideas for Halloween, with ideas on how to do a family Marvel theme too. 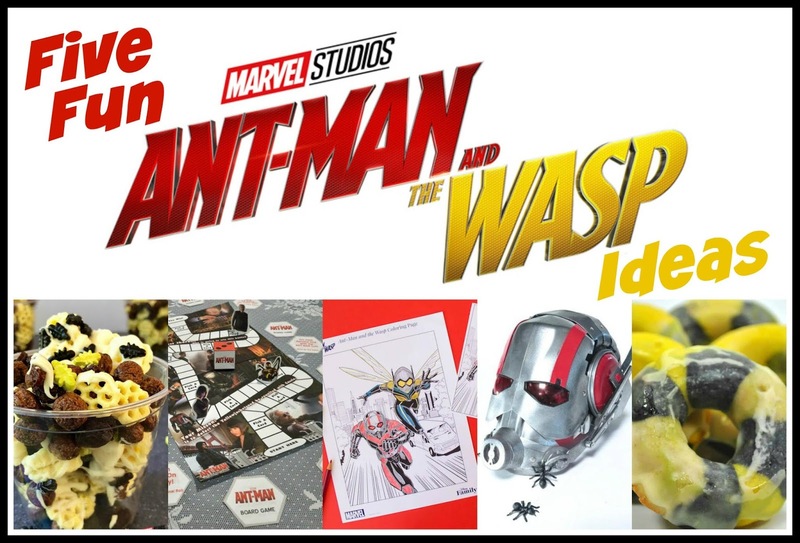 Download and print coloring pages featuring the characters from Ant-Man & the Wasp! Are we the only people who love coloring while we are watching a movie? And one bonus idea! Feeling really ambitious? Check out how to make an Upcycled Ant-Man Helmet from Instructables. It's well beyond my abilities, but it is amazing! In “Ant-Man and The Wasp,” Scott Lang is grappling with the consequences of his choices, as both the Super Hero, Ant-Man, and a father, in the aftermath of “Captain America: Civil War.” As he struggles to rebalance his home life with his responsibilities as Ant-Man, he’s confronted by Hope van Dyne and Dr. Hank Pym with an urgent new missionto rescue Janet van Dyne from the Quantum Realm. Scott must once again put on the suit and learn to fight alongside The Wasp, all while attempting to serve house arrest, assist fast talking-Luis and the X-con Security crew, and thwart the efforts of a new adversary called Ghost and her ally, Bill Foster. Ant-Man & The Wasp is available for digital download now, and on 4K Ultra HD™, Blu-ray™ and Blu-ray 4K Ultra HD™ on 10/16/18. We can't wait!